If you’re in need of an ideal destination for your ski holidays, then Alpe Cermis may be your answer. You can enjoy some of the longest and well-known ski slopes in the region, with night-time sessions available for those evening thrill-seekers. Aside from skiing, Alpe Cermis offers a range of gastronomic delights, with local winter dishes and exclusive offers for food lovers. Alpe Cermis is locating in Val di Fiemme, Trentino. 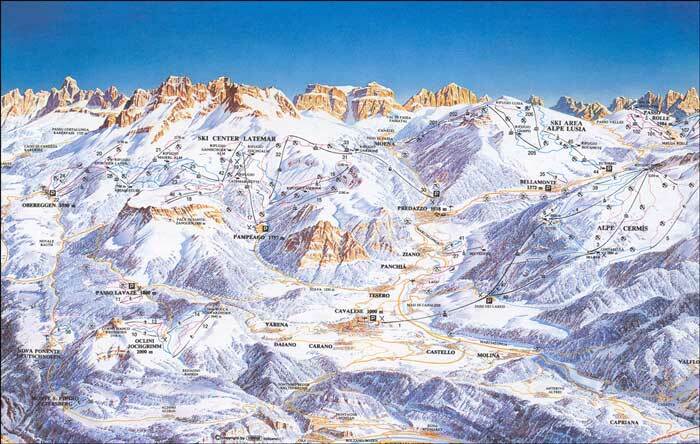 The resort itself is quite high, but you’ll be able to get there using the cableway from Cavalese. In need of a little more? If you’re a particular ski enthusiast and Alpe Cermis doesn’t offer quite enough, there’s no need to worry, as the resort is part of a much larger circuit – Dolomiti Superski. With an overall ski pass you can enjoy slopes that reach up to 1200km long. We avoid flat pricing systems for transfers to and from Alpe Cermis. Our base-rate for ski transfers will only ever go down as a result of the above – we never over-inflate our prices at any time or for any reason. We also offer substantial discounts for off-peak, off-season and midweek transfers to Alpe Cermis. If you’re looking for the best possible deal, we recommend travelling outside peak season or midweek, as this typically leads to the biggest savings. We offer midweek, Monday to Friday prices with up to 60% off regular weekend prices. Your transfer quote will also depend on vehicle availability, transfer schedule, vehicle utilisation and other costs such as road tolls and airport parking charges. If you have any specific requirements, such as travelling as part of a larger group, please get in touch with us directly so we can discuss this. Alpe Cermis is famed for providing an equally enjoyable experience for all levels of skiing ability. From first-timers to seasoned pros, there’s plenty on offer for everyone. Alpe Cermis is a great destination for family ski holidays. Kids can find plenty to do, with easy and gentle slopes for beginners, and friendly, professional ski schools. You’ll also have access to Cermislandia, an outdoor playground area for children. It offers winter games, sports and different entertainment options every day, so your children will always have a unique and enjoyable holiday experience. Why choose Alps2Alps for your transfer to Alpe Cermis? We’re committed to delivering the highest quality transfer service with the lowest possible prices. We pride ourselves on our punctual, reliable and flexible transportation and we’re sure you won’t find a better deal elsewhere. To get the possible deal with us, book in advance and have a smooth start to your holiday. Should you have any questions about your resort, service, or transportation, get in touch with our team. Call us to get your trip off to the best possible start.